The Pavlova cake is an Australian dessert named after the Russian ballerina Anna Pavlova, whose dance was as light and “fluffly” as the texture of the cake! PS: When I mention “Australia”, I mean the continent, rather than the country. There has been an ongoing debate between Australia and New Zealand over the origination of this cake, and is the national dessert of both. Since it is was Valentine’s Day, [ sorry I’m late! 😦 ] which was also close to my sister’s birthday, I decided to bake her a heart-shaped birthday cake! Tiara was visiting from Singapore and she complained that the Pavlova cake was non-existent there. Her intense craving for one prompted her to demand request the meringue cake for her birthday. 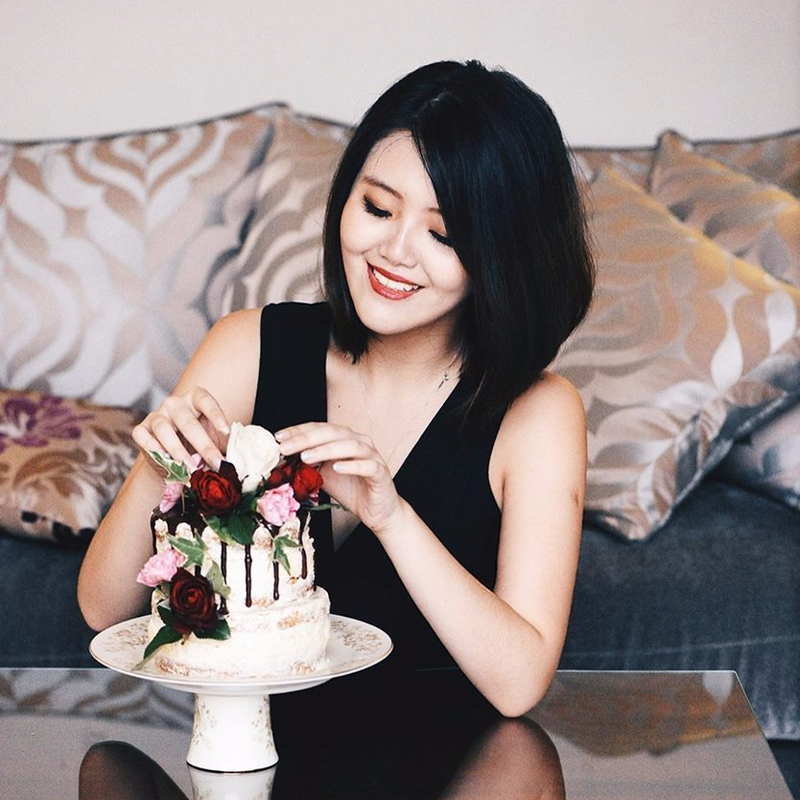 I actually found it odd that she had difficulty finding a Pavlova in Singapore, given that the Singapore-Australia immigration has always been quite significant. 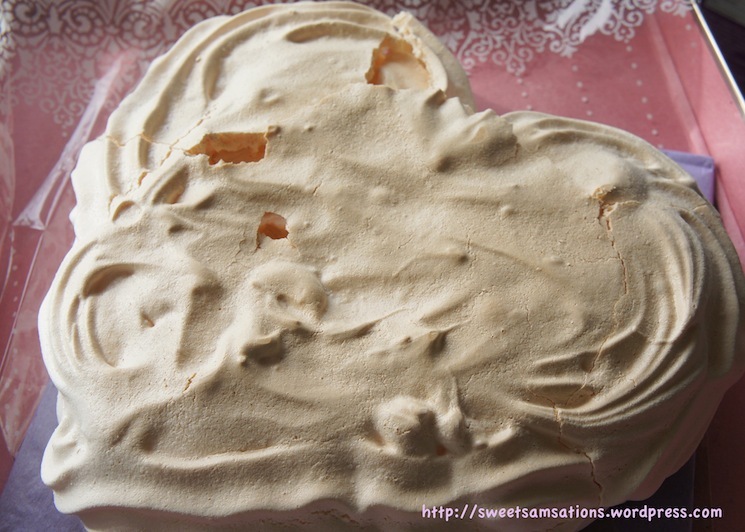 Anyway, I decided to try Tish Boyle’s “Perfect Pavlova” recipe from The Cake Book, but shaped it in a heart. I added 2 tablespoons of sliced almonds too. 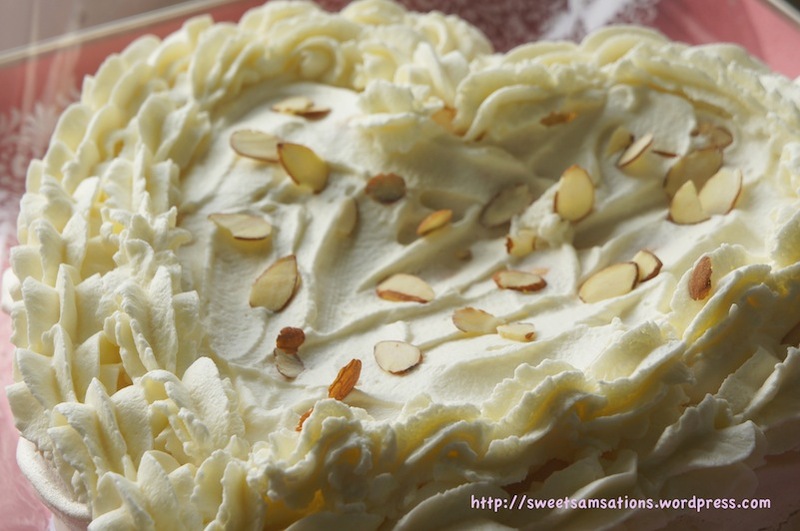 I love having almonds with my whipped cream! On a piece of parchment paper draw a heart shape approximately 9-inch in diameter. Turn the paper upside down and place it on a baking tray. Using a whisk attachment on your stand mixer, beat the egg whites at medium speed until foamy. Add salt and cream of tartar, then beat at medium-high speed until soft peaks begin to form. Gradually add sifted sugar one tablespoon at a time, then increase the speed to high and beat whites until stiff peaks form. Remember to scrape the sides of your bowl! With a silicon spatula, transfer part of the meringue onto your parchment paper, and spread it evenly with a metal spatula. Fill the rest of the meringue into a large pastry bag fitted with a star tip. I used Wilton’s 1M. Pipe the meringue outlining the edges of the heart. This will give your heart-shape a more defined look. Make sure that the sides are slightly taller than the middle. Bake the meringue for 1 hour, or until it is lightly coloured and dry to touch. Turn the oven off and leave the meringue in the oven for at least 2 hours. Don’t worry if your meringue cracked a little like mine here. We’re going to be covering it up later on anyway. The filling should only be made 2 hours before serving. If it is place on top of the meringue shell for too long, the meringue will lose its crispiness and turn soggy. Using a whisk attachment, beat the heavy cream with the confectioner’s sugar and vanilla extract at high speed until soft speaks form. If not ready to serve, cover and refrigerate. Right before serving, pipe the filling onto the meringue shell. I made a shell border with 1M. Add sliced almonds. Yummay!! My sister really liked it! She thought it was really gooood. The cake can’t keep for too long though! So finish it on your first sitting if you can. hehe of course not! Silly BB! Glad you liked it! Thanks Kay!! yeah! 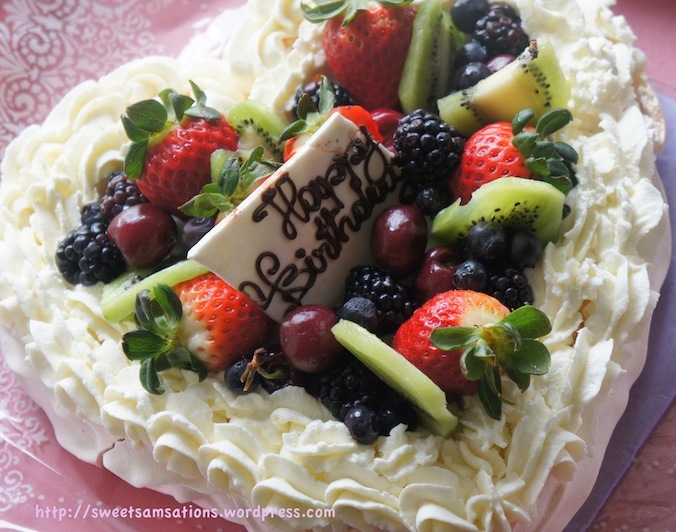 Whipped cream + fresh fruits make a great combination! lol! Oh yeah, that’s right. mmm.. Give it a try! It doesn’t need too many ingredients either! Sam, you did a super amazing job! 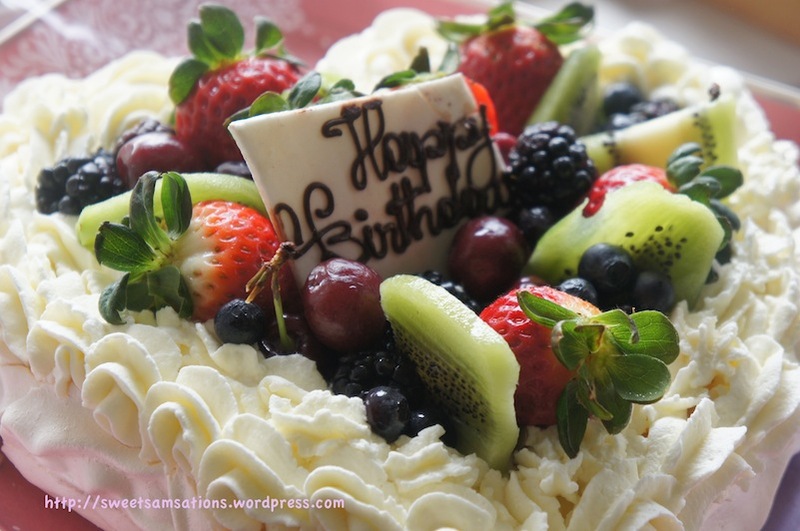 This cake is gorgeous and I think a perfect birthday treat! I bet it was uber delicious too. I’ve never had pavlova but just looking at your pics, I wanna go out and try it right now! Awww! Thank you Tia!! Yeah, this is actually my second time trying the Pavlova! First time was store bought. haha.. They’re actually quite expensive considering the very few ingredients it requires! This looks absolutely beautiful! I may just have to make this for my daughter’s birthday this weekend! Aww!! I’m happy to hear that!! I hope your daughter will love it as much as my sister did! haha..
What a stunning dessert!!! And it looks equally delicious. Just beautiful!!! O that is gorgeous! 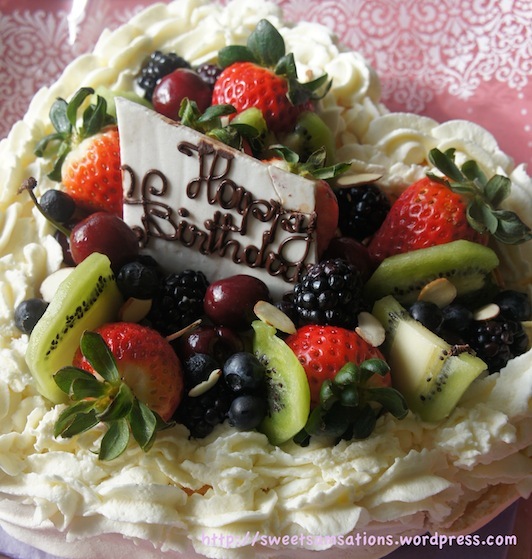 I love pavlova (no matter where it originally is from..lol) and this looks just beautiful! Yup! Thank you for your compliment, Simone! I love pavlova too!! I also love that it’s low in carbs, and with so many fruits, it almost feels like a diet dessert! lol. I just adore pavlova. It looks so elegant and there are so many things you can top it with. I’m sure your sister was delighted! Wow thats a really nice pavlova! Thanks Raymond!!! Yours look pretty good too!! I love pavlova and this looks delicious!!! Thanks for visiting my page and leaving such a sweet comment 🙂 You made my day!! 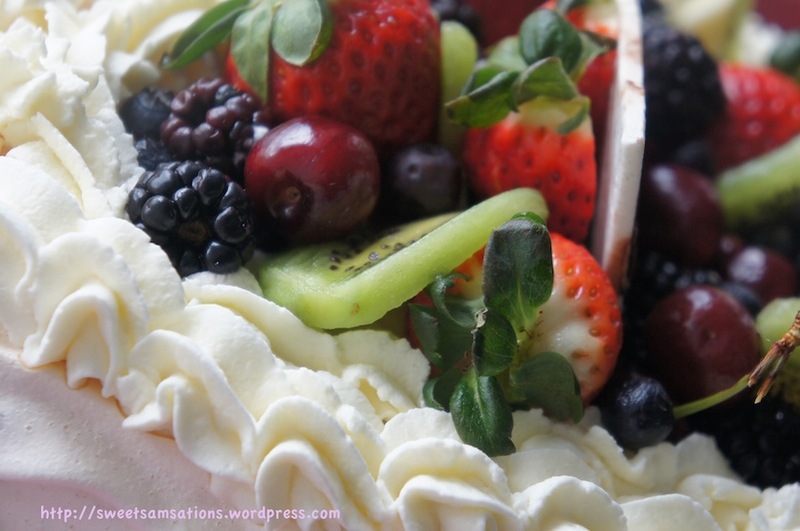 This pavlova looks gorgeous! I really want to make pavlova for so long. Never tried making or haven’t tasted one. The look and sound of it is fab. 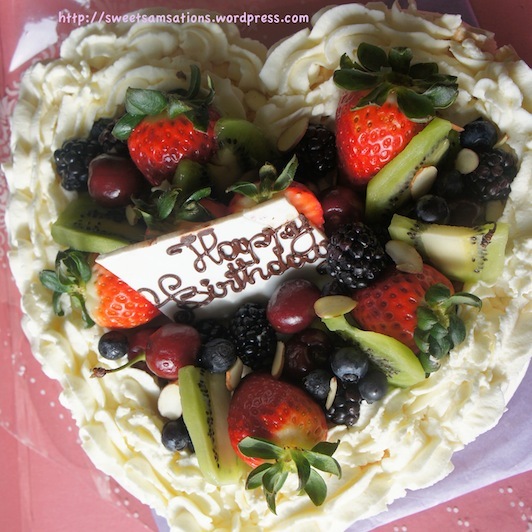 I love the way you have decorated it with fruit on top. Lovely!!! How beautiful! The fruit on top looks so luscious. Thanks Lora!! Yeah, I can’t live without fruits! I think that’s why I like having pavlova! I probably eat 5 fruits a day… lol..